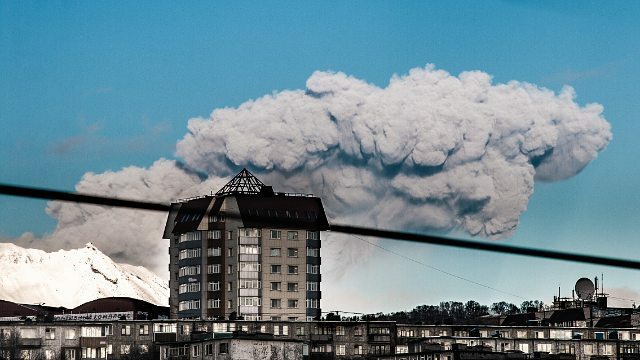 Zhupanovsky (Kamchatka, Russia): After its re-awakening 3 days ago, a strong explosion occurred from the volcano yesterday at 13:50 local time and produced a plume that rose to approx. 30,000 ft (9 km) altitude and drifted SE. It was clearly visible even from the capital Petropavlovsk. Whether it was a phreatic (no magma involved), or phreato-magmatic or even magmatic eruption remains unclear at the moment. The aviation color code of the volcano was raised to orange. Awu (North Sulawesi & Sangihe Islands): Last week, PVMBG raised the alert level of Indonesia's northernmost known active volcano a notch, as small signs of new unrest had been detected recently: mostly, this is an increase in shallow seismic activity since the summer and more pronounced since the middle of November. Colima (Western Mexico): Intermittent explosions of small to moderate, sometimes large size continue to occur at the volcano. Attached image from 25 Nov shows a moderately large event. Santiaguito (Guatemala): A phase of elevated activity has started at the volcano since 29 November. The largest event so far occurred this morning at 07:07 local time, when a strong explosion produced an ash plume that rose approx. 2-3 km and (probably) a small pyroclastic flow. Ash fall occurred in nearby villages and towns including San Marcos Palajunoj, and Finca La Florida. During the preceding days, several smaller, but significantly larger than average explosions occurred from the Caliente lava dome, which on average had only been producing 2-3 small explosions per day before. Fuego (Guatemala): The 12th paroxysmal eruptive phase of the volcano during 2015 has ended over night. During its peak yesterday, lava fountaining from two summit vents fed 5 lava flows on the volcano's western, southern and eastern sides reaching lengths of 1.5-3 km. According to INSIVUMEH, this episode was the largest of the 12 eruptions in 2015 by lava output volume, but remarkably only generated smaller pyroclastic flows headed towards barranca Honda. Momotombo (Nicaragua): A series of at least 4 small explosions occurred at the volcano this morning, at 07:49, 08:17, 08:42, and 08:55 local time. The eruptions, in particular the last and largest one, produced steam and ash plumes that rose up to approx. 1 km from the summit. Light ash fall was observed in the community of El Papalonal and near the Momotombo geothermal plant to the SW of the volcano. This marks the first eruptive activity of the volcano in 110 years, the last confirmed eruption of Momotombo having been back in 1905. Since 1524, the volcano has known 16 recorded eruptions, most of them small, probably phreatic explosions. Larger eruptions occurred in 1605 and 1609, when explosions ejected larger bombs and blocks to considerable distances,- reportedly they fell in the area of the now abandoned town of León Viejo approx. 6 km west from the volcano. Turrialba (Costa Rica): A small eruption occurred from the volcano's western crater this morning at 06:38 local time. Copahue (Chile/Argentina): Activity at the volcano continues to slowly increase. Over the past days, continuous explosive activity at the summit vent has been producing a plume of dark ash that reached 1-2 km height and drifted into easterly directions.